Beware of spoilers below if you haven’t seen the series yet! It all starts with a detective in the Special Investigations Unit (SIU) squad of the Nihama police discovering that the detectives have had interceptors secretly put in them. Interceptors are machines put in the body that record everything a person sees and can transmit this information. Superintendant Daido the chief of police did this with the help of a select few like the chief of Nihama police Nibu to secretly monitor the force. Specifically, it was to monitor the SIU and their findings concerning the ongoing laughing man investigation. The detective gets killed when he discovers this (remember the flashing in his eyes that led to his car crashing) but with some luck he manages to give some photos as evidence to Togusa that used to work with him. With these photos and the help of an SIU detective that talks to Togusa about interceptors, Togusa figures it out and section9 starts looking into the whole affair. Fukami, SIU investigator talking to Togusa. Section 9 leaks the info and Superintendant General Daido’s plan goes into action. Daido calls in a press meeting to tell the press they fired Nibu the chief of Nihama police responsible for the interceptors problem but this is just an excuse to have his colleague ghost hacked live on air by what appears to be the laughing man. It is Daido and his shadow accomplices portraying themselves as the laughing man that are doing this. A vague threat to Daido’s life is said in a theatrical fashion. If Daido doesn’t say the truth he’ll be eliminated at a public event supposed to happen a few days after. The conspirators (Daido and his accomplices) plan is to make a certain Nanao-A be the laughing man and have the SIU catch him in the act. In order to make the SIU think that Nanao-A is the laughing man, they rewrote the memories of certain people, they created witnesses for the SIU that all led to Nano-A. Nanao-A and the conspirators are acting together in this plan. Nanao-A wants the fame and wants to be recognized as the greatest hacker:the laughing man. Nanao-A launches his virus from his hideout which makes a guard attack Daido, this threat is easily dealt with by the Major but something unexpected happens. A lot more people try and kill Daido. This was not planned at all by the conspirators. Instead of letting Nanao-A live they kill him. Police HQ decides to continue the laughing man investigation after this weird event where dozens of copycats that weren’t hacked or controlled in any way also tried to kill Daido. The major and Aramaki talk about this phenomenon but don’t call it by it’s name yet: a stand alone complex. 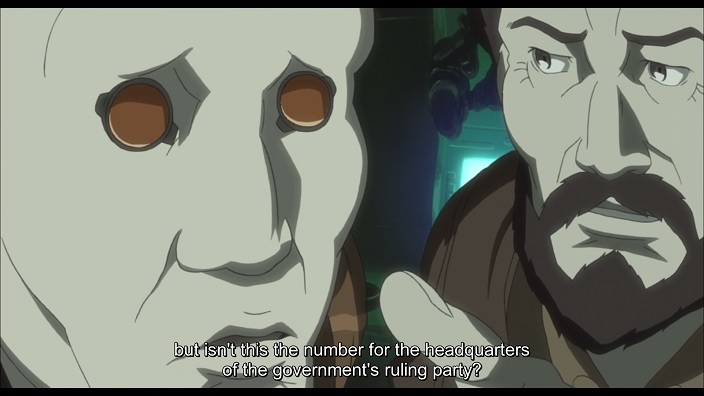 A stand alone complex as explained in gits:sac is an emergent phenomenon where multiple independent individuals or groups seem to be acting together. Daido and his accomplices did not want anyone uncovering the real truth behind the laughing man case and this is why they secretely monitored the force. If a detective was going to get close to it they had to know in order to eliminate him before he could get the truth out. An interesting link between Daido and serano genomics, a micromachine technology manufacturer, is also revealed. The interceptors used by the conspirators were made by serano. We also see Daido talking to Serano Genomics on the phone multiple times. This first incident ends with Daido resigning and Aramaki informing him he’ll investigate him and the whole laughing man affair. A greater conspiracy is at play here. Funnily enough, it’s a tv commentator that the major is watching at her friends’s place that lets us take a glimpse at the bigger picture and what’s to come. The ministry of health, labor and welfare is hacked by someone from the location of a mental health facility. Togusa goes there undercover as a worker to figure out who’s responsible. While there he is responsible for a small group of kids and a certain young man pretending to be a deaf-mute called Aoi. While communicating to the major from inside the facility he sees a quote written somewhere. Togusa sneaks into the boss’s office and sees that she isn’t the one responsible for the cyber attack. He gets caught in the act and fails the operation not knowing who actually did it. When he draws the portrait of Aoi he draws the laughing man logo and no traces of Aoi are to be found in the facilitie’s systems. Aoi erased himself from the memories of people he met in there and escaped the facility. 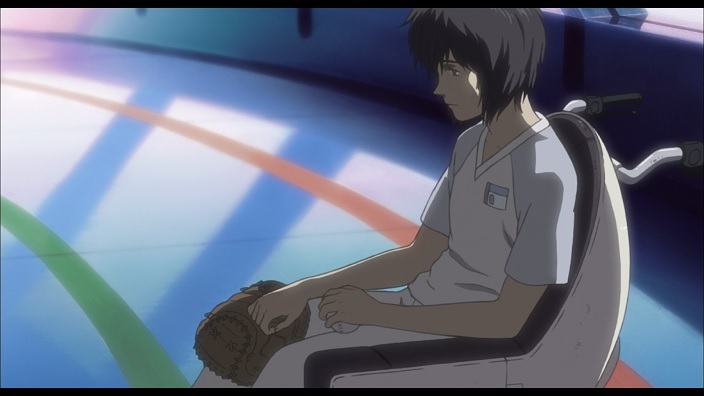 He leaves behind the baseball mitt and the ball for his friends to remember him. The baseball mitt and part of the quote are references to Salinger’s The catcher in the rye book. We learn that a part of the ministry of welfare were the ones that rewrote the Nanao-A witnesses memories. They are part of the conspiracy. Aoi is after something physical, a book that the ministry of welfare has. It seems like his hacking attempt into the ministry was unfruitful and did not yield the information he was after. The book he gets by ghost hacking a ministry of welfare janitor is the list of murrai vaccine’s recepients. Cyberbrain sclerosis is a neurological illness that anyone that gets cyberized can potentially have. There are two treatments for it, the murrai vaccine or micromachine treatments that are more or less effective proposed by different firms, one of which is serano genomics. In the beginning when scientists and doctors were looking for a cure, the murrai vaccine was the first to work but got rejected whereas the micromachine treatments got accepted yet they didnt work at the time. Aoi knows of one important man on the murrai vaccine’s recepients list and that is the person that was a chairman on the drug council at the time of the first proposed cures, a Mr. Imakurusu. 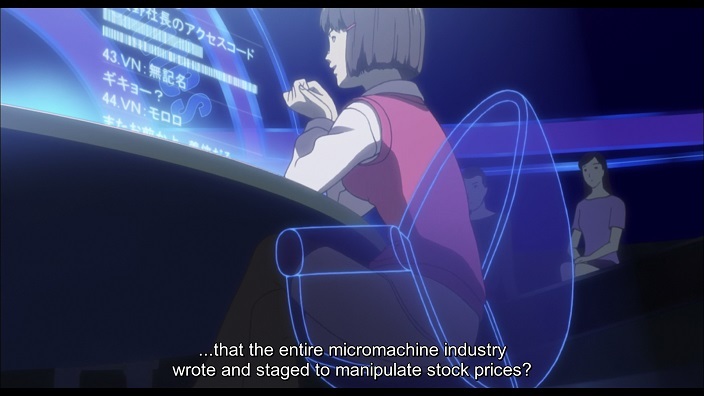 As is explained, Imakurusu rejected the murrai vaccine out of jealousy for murrai and out of financial interest, he was on the board of a micromachine company and had a clear interest in making a micromachine cure be approved by the council. The micromachine treatments went on to be used by patients even though they were totally innefective. After a while the micromachine treatments started to work more or less. Still, Imakurusu prefered to use the murrai vaccine for himself. As Aoi would say, Imakurusu is a phony. The murrai vaccine got accepted by the drug council after a while but this isn’t well known by the population. Aoi sends this book off to the sunflower association that wants people to know about the murrai vaccine and about the truth. 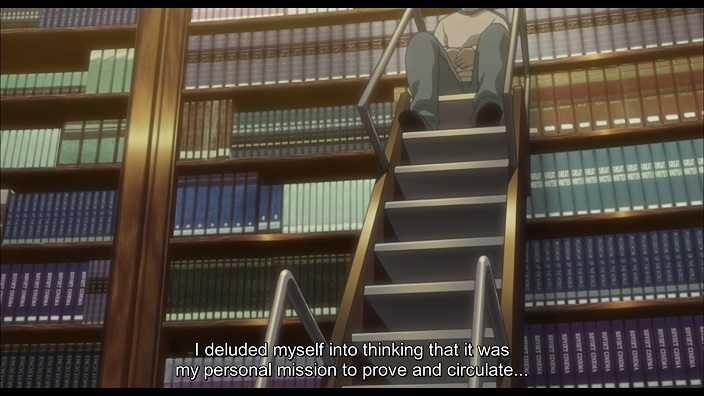 Togusa figures out that Aoi was after a book and manages to track a copy of it down at the sunflower association. But all the employees get killed by the DEA controlled by a certain Nimii of the ministry of welfare. They’re also after the book and do not want anyone to know the truth. Togusa barely escapes from the bloodbath. Aoi made it look like Imakurusu sent the list to the association to put pressure on him and force him to testify and reveal the truth. 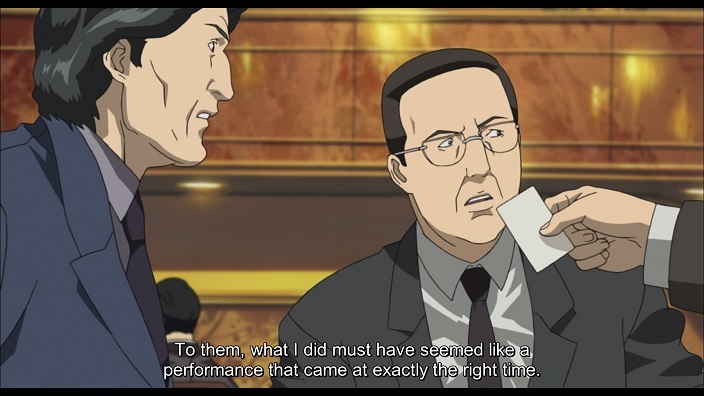 Once the DEA killed all the people at the association that might have learned the truth and get the copy of the list, they go after Imakurusu kept by Aoi in a hotel. 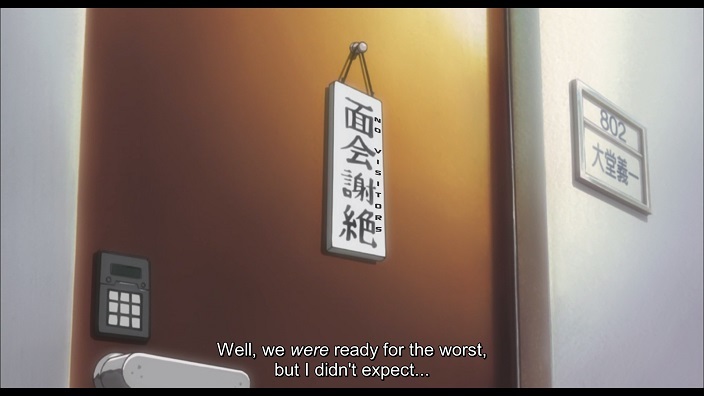 Imakurusu calls someone he thought he could trust for help but it alerts both section 9 and the DEA to his whereabouts. A fight ensues between section 9 and the Dea and Imakurusu gets killed. 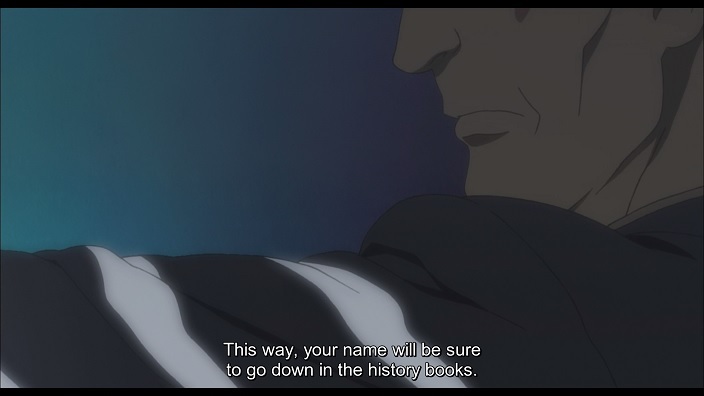 Aoi gives the original copy of the list to Batou and dissapears. Section 9 comes out victorious and arrests the chief Nimii that was giving orders to the dea but three members of the now disbanded group are still out at large. Two of them try to get to Aramaki by using his brother as bait but fail thanks to Batou acting as a savior. The last of the three tries to kill the Major during her body swap but this time it’s Aoi doing the saving. A deal is made between Aoi and the major, she promises to him that she’ll let him fight the final battle in his own way and if he was to fail and die section 9 would try and reveal the whole truth of the conspiracy. Aoi and the major also synchronize together and share information and memories so that the major knows the whole story that aoi knows. The man at the very top of this conspiracy is secretary general Yakushima. This is the person Imakurusu most probably called from the hotel for help, the number called was directed to the headquarters of the government. He made a lot of money in an unknown suspicious way and an investigation was started but never uncovered the origin of the money because the prosecutor in charge died. Superintendant general Daido of the police was a junior of Yakushima at the national defense academy and the ex-chairman of the drug council Imakurusu was a golf buddy of Yakushima. The links between the different conspirators are pretty clear. It seems like Imakurusu wasn’t privy to the whole affair though because when Aoi tells him it wasn’t him that blackmailed the corporations he seemed shocked. The major with the new info she has disguises herself as Aoi and kidnaps Serano from his home, exactly as Aoi did all those years ago. The way she did it was by hacking the eyes of the serano security people and detectives. 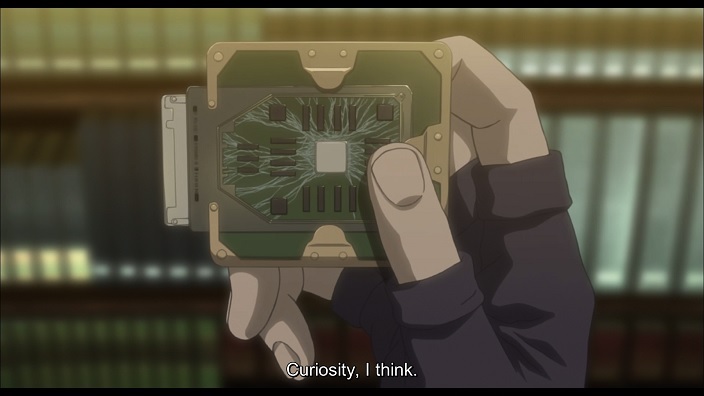 Batou shows them that even though their eyes and the cameras were hacked, the interceptors that they still have in them show her really there. The conspirators never stopped secretly monitoring. By talking with Serano the major makes sure that the information Aoi gave her was truthful. We learn some important facts. Serano has basically been monitored and put under house arrest all these years since the initial incident to make sure he didn’t reveal the truth. Serano Genomics was approved by the drug council even though their cure did not yet work. Serano deluded himself into thinking this was not suspicious and just wanted to work hard to make the micromachine cure work. When Aoi kidnapped Serano all those years ago, a huge ransom was asked to the company Serano Genomics as soon as they both left the home. This is an important fact. It means that a third party, the conspirators, came into action soon as they learned of the kidnapping. As Aoi puts it, it was a performance that came at the right time for them. Serano made a false promise to Aoi in order to escape and it worked. Aoi did not successfully make him admit the truth at that time. Once Serano was released from Aoi and the police questionned him, Serano did not want to reveal that his micromachines did not work properly. That would destroy the credibility of his company. Serano Genomics was being blackmailed with this secret by the conspirators, ie Yakushima and co. This was planned all along. Then the conspirators unleashed a virus that affected the production of Serano’s micromachines that made the stock crash. The government seeing the virus troubling Serano Genomics helped by giving public fund money. A figurehead of the conspirators came to Serano and told him that if they gave him the ransom money initially demanded and the public fund money Serano Genomics had received, the blackmail would stop. They did the same to many other micromachine health companies. They created the name “Laughing man” to use as the one responsible for all this corporate blackmail. They also manipulated stocks. They knew when the blackmail and virus attacks began so they knew when the stocks would crash. This made them be able to short the stocks, making them a lot of profit. We can see all the stocks crashing except the Satsuma stock. The Satsuma company was the only one that didn’t receive any public funds meaning that the government didn’t think they had been blackmailed. The Satsuma company top executives just pretended it had been for financial gain. The conspirators had a clear premeditated plan with precise targets and a precise modus operandi. 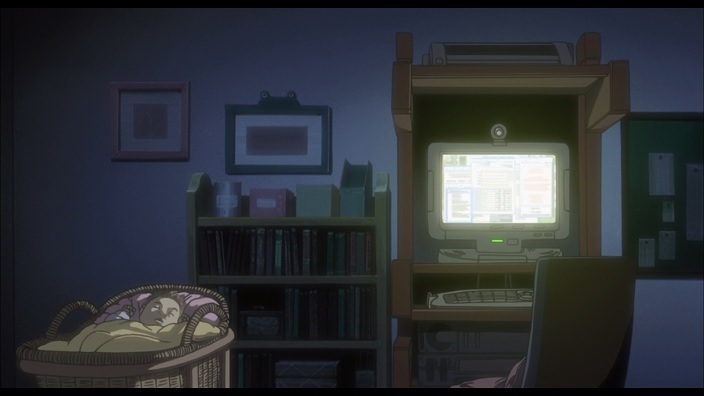 We see a scene where Togusa’s home computer turns on on it’s own and buys serano stocks . Togusa’s computer buying Serano stocks on it’s own. As the girl in the chatroom thought, the conspirators even had a financial program that manipulated the market at the time of the initial incident and even well after. The program didn’t stop probably because the conspirators had to sell the large amount of stocks they had gained. Once Serano agreed to give the ransom money the blackmail ended. Yakushima and his accomplices had successfully managed their machievallan plot. This also explains where Yakushima got his money, something the dead and likely murdered prosecutor tried to find out. The major gets photographed during the laughing man disguised operation and the op gets leaked to the media. Elections were coming up for the prime minister so he refused to go on the offensive against Yakushima before they had taken place. He did not want any trouble that could lead to him or his party or not getting re-elected. He also needed to deal with the wish of the media and population to get rid of section 9 that they thought was guilty of being the laughing man or at least was seen to be too powerful and not controlled enough. Aramaki warned his team and instructed the major to survive. The navy was used by the prime minister to fight and capture section 9’s members. A few members managed to leak out the information on Yakushima’s involvement in the conspiracy before getting captured. They finally all got captured except the major that got “killed”. Of course she was only using a puppet body and the slow zoom on her left arm indicating that she wasn’t wearing her watch was a big clue of this. The team wasn’t aware of Aramaki’s plan but it worked. The PM promised to Aramaki that after the elections the public prosecutor’s office would go after Yakushima and bring him to justice. 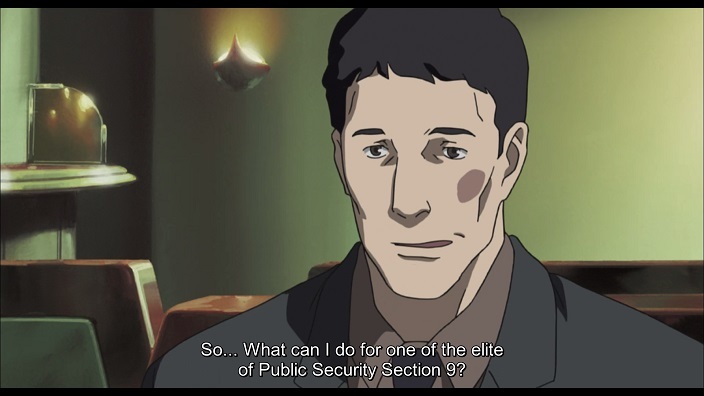 In exchange for this promise, Aramaki would sacrifice section 9 to appease the media and the population’s wish and this would help get some political heat off the PM. Not only that, it’d also make section 9 go back to not existing in the public’s eye, section 9 would be a secret unit once again. 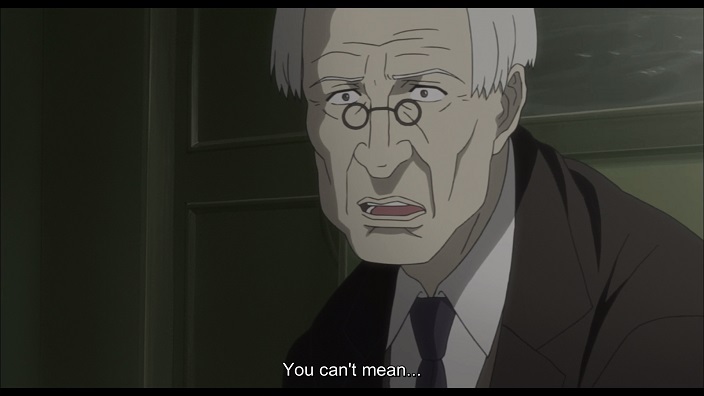 The major and Aramaki go and see Aoi and try to have him join the team but he refuses. Finally we see one of the conspirators booby-trap the car Serano goes in. Whether Serano gets hacked or killed because of this unsure but the noise we hear indicates that the trap has worked. This conspirator is Fukami, the one that was part of the SIU team. Notice his birth mark on the upper left of his face. He’s the one that talked to Togusa about interceptors, he’s the one that killed Nanao-A. He killed or incapacitated Serano to stop him from testifying against Yakushima. In gits:sac, the network is such that individuals have access to a vast array of information that they can share in many ways. Aoi shares the information he has with the major when he saves her during her body swap procedure. The major can even pass herself as Aoi “the laughing man” with the information she gets from this synchronisation or parallelisation of information. Synchronisation of the major and Aoi. Humans have not yet turned themselves into shell-less (meaning bodyless) beings represented by data on the network with all infomation shared. Individuals still retain their individuality and have not yet been turned into “unique components” of a bigger whole. The question asked by the director Kamiyama is, in a future world that is in that state, can beings still have their individuality? The tachikomas are section 9’s autonomous intelligent tanks that they use to fight with and as backup. They experience the world with their tank bodies and at night when they return to section 9’s section, all the information and experience they each gathered that day gets synchronised/parallelised between them all. Normally one would think every one of them would then be exactly identical, after all they have the same exact information and experience but we see that that is not the case. Batou has a favorite tank and when he calls for it there is no ambiguity as to which Tachikoma it is. Another one starts to fancy books after some time. In an episode, one tachikoma goes out and has an adventure outside with a little girl that recently lost her dog. Curiosity made him want to explore the outside world. Curiosity we are told is the answer to retaining or having this individuality even though all the information is parallelised. 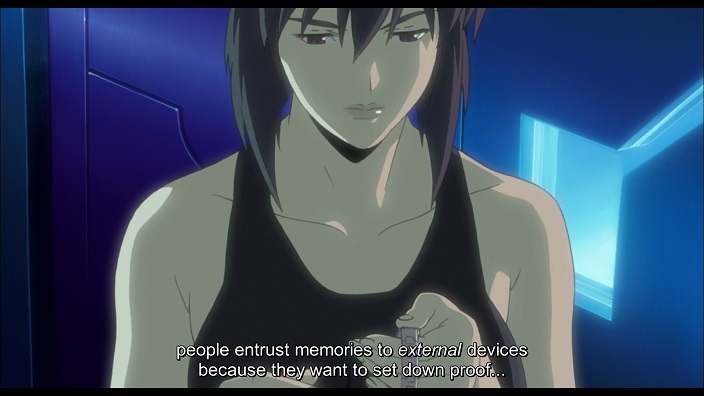 The major explains this to Aoi while looking at the component of the now destroyed tachikoma that sacrificed himself to save Batou. The major even wonders wether this acquired individuality indicated that the tachikomas had a ghost. Further than just individuality a tachikoma even muses on the possibility of a mass of data with no body having a ghost, something reminiscent of the 1995 movie. I find it likely that the tachikomas did acquire a ghost by the end. 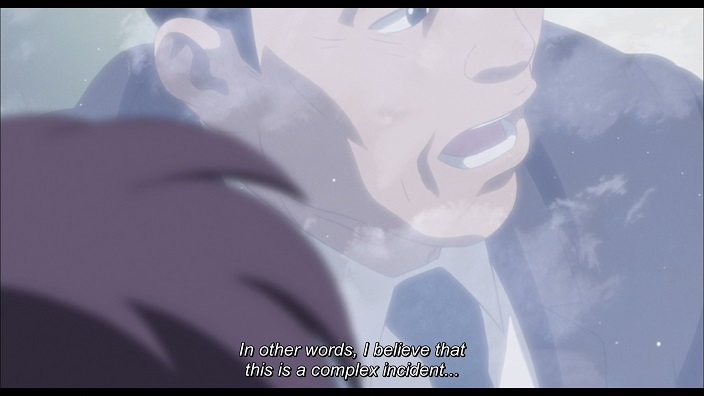 But in this current world of gits:sac the ubiquitousness of information could lead to “complex” situations. Such as a stand alone complex. J.D Salinger wrote a short story titled The laughing man. In it a bunch of kids are told a story about a protagonist nicknamed The laughing man that has a scarred face and wears a mask. This character gets is in crazy situations and shows great courage and heroism. The kids all believe to be descendants of the laughing man and at one point, they even believe that they are him. Another story of Salinger is The catcher in the rye where the main character, Holden, hates what he considers to be fake or phony. The baseball mitt, hat and numerous quotes Aoi uses come from this novel and it’s the novel Togusa is shown to be reading. 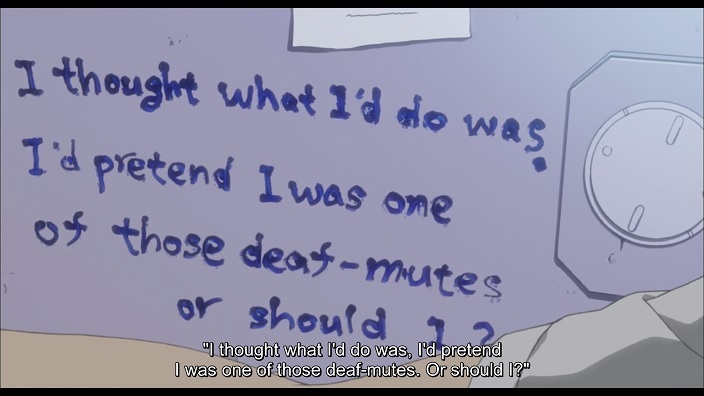 Aoi used a laughing man logo with the quote “I thought what I’d do was I’d pretend I was one of those deaf-mutes” from the catcher in the rye. Holden says this when he’s sick and tired of the fakeness of the adult world and wants to escape it. Aoi explains that it was the conspirators that used the name “the laughing man” to give a name to the man to blame behind their actions. 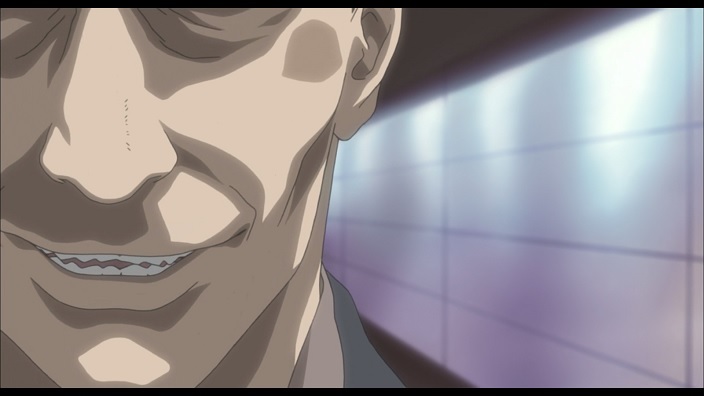 The laughing man of Salinger and of gits:sac is a heroic figure that everyone wants to be, someone that is seen as cool. But he’s someone that wears a mask, someone that everybody can convince or rather delude themselves to be. The name the conspirators used makes a lot of sense. Aoi found a mail sent to Serano that contained a comparative study between the murrai vaccine and the micromachine’s innefective treatments. His desire for justice and truth to be revealed made him take action and kidnap Serano. All the other events started after this and Aoi after having failed in his mission became a deaf-mute and dissapeared. The person that created that mail is not known. What can be deduced is that Yakushima and his close accomplices had to discover this information from this mail or another source (Imakurusu maybe?) before Aoi went into action and kidnapped Serano because they immediately asked for a huge ransom to Serano’s company the moment Aoi and Serano stepped out of the door. Aoi deluded himself into thinking he was the only one that knew this information and that he had to be a hero and reveal it to the world, he became the copycat of an unknown original. The conspirators acted as someone who had a motive. 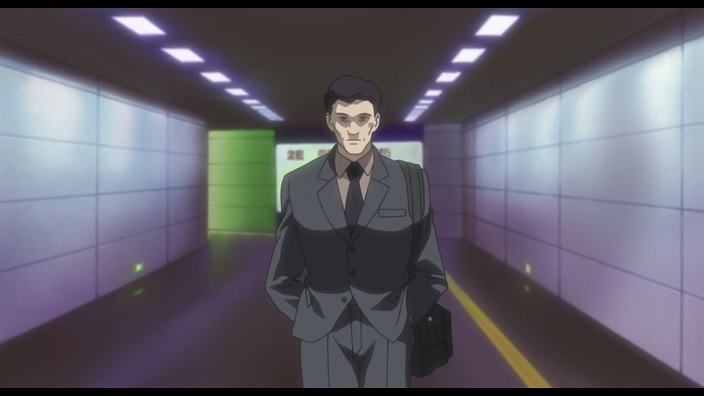 The major and Nanao-A also became a copycat of the laughing man and acted as someone who had a motive. Some of the people who tried to kill superintendant Daido acted as laughing man copycats, these are the third party with no real motive. They only tried to kill Daido because of the vague threat the laughing man(that was actually the conspirators in that instance) made towards Daido on tv. This stand alone complex phenomenon is an emergent phenomenon that results from a more and more interconnected world with information being shared by more and more people. Individuals or groups acting independantly from each other can seem to be acting cohesively giving birth to the phenomenon called a stand alone complex. But the information seed that starts it all and the events thereafter can be used by all these different individuals for different motives exactly like in the case of the laughing man. 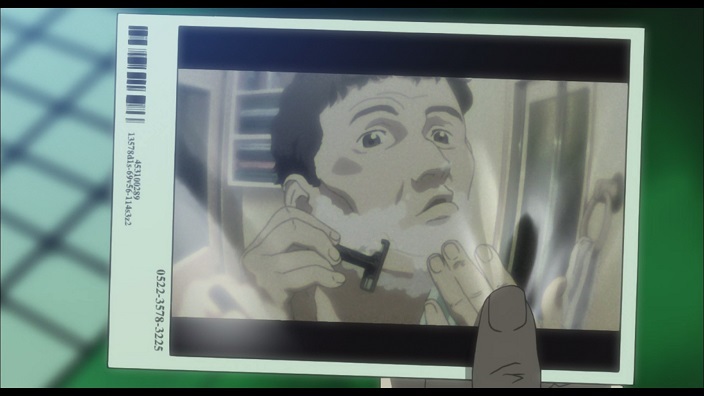 The major’s watch, Batou’s weights and Aoi’s books are objects that anchor them to their individuality. 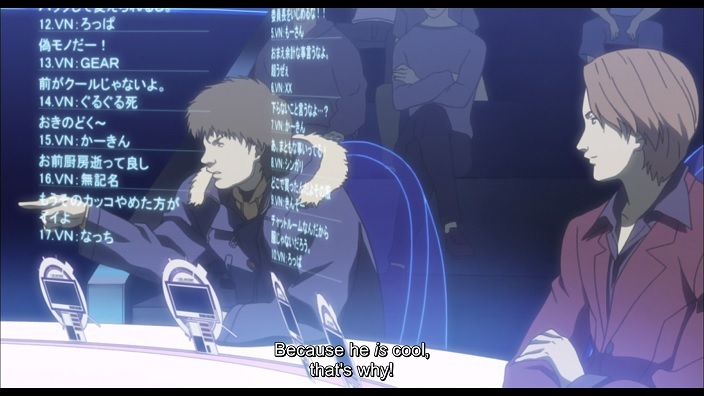 The major and Batou talk about this idea. When Batou and the major are escaping together the major tells him that she might not be the same person when they see each other again. She downplays the emotional importance the watch has for her to Batou. In a world where bodies can be changed and memories can be erased relying on physical objects can be reassuring and reinforce/safeguard one’s individuality. 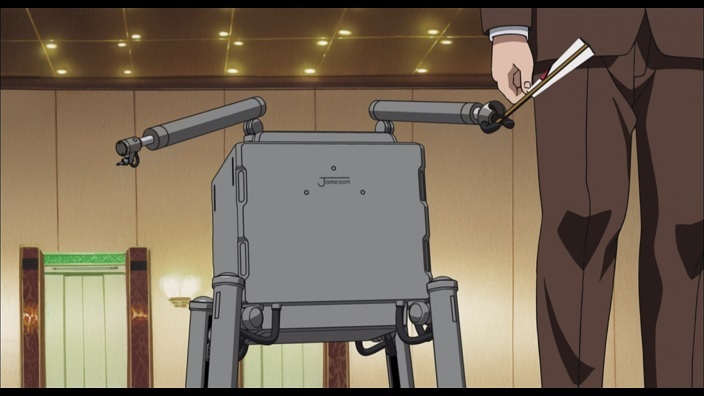 Another thing to notice is that some physical objects are also tied to tachikoma’s. 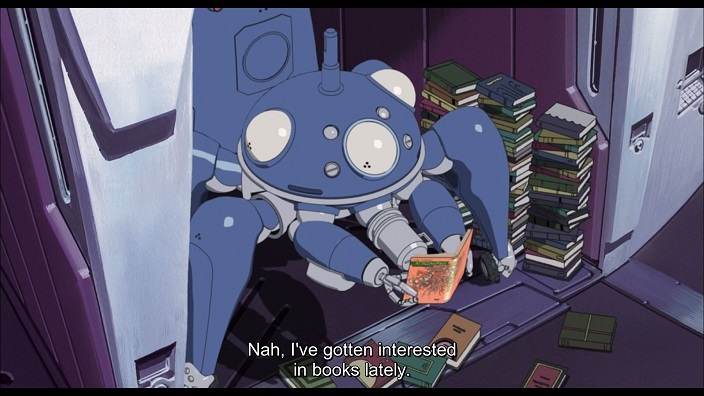 Batou’s favorite tachikoma had his own special organic oil for a time, another tachikoma is seen to be holding books and explains he likes reading them. Their individuality also started to show through this manner too. In a broader context, the importance of bodies is also discussed. 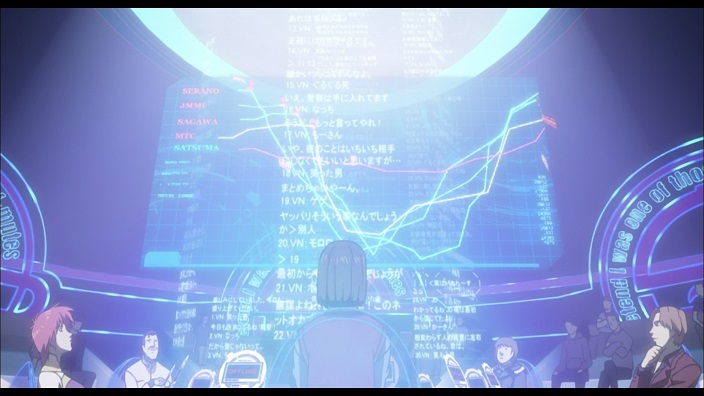 The world of gits:sac is a world where humans still exist through organic or cybernetical bodies. As we see in stand alone episodes, the market for organic body organs is still a very real thing and cybernatisation is fought against by some people. At the same time there are also people that use Jameson type body models that are very different from humanoid bodies. 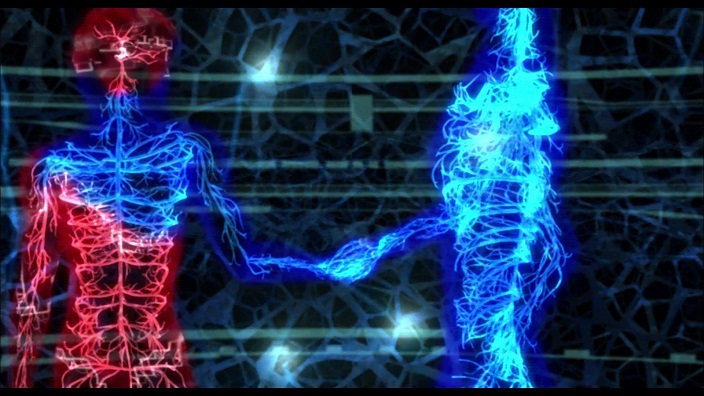 And to push it further, why have any bodies at all if one might be able to exist as an individual on the network. 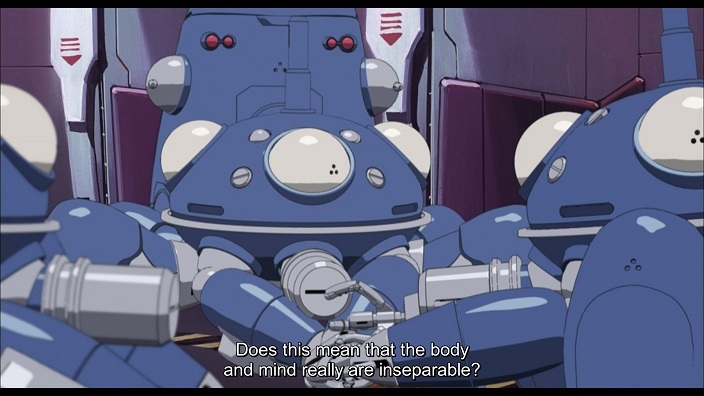 As one tachikoma asks,are the body and mind insperable? Are they necessary to be able to have an individuality and moreso to be able to keep it? 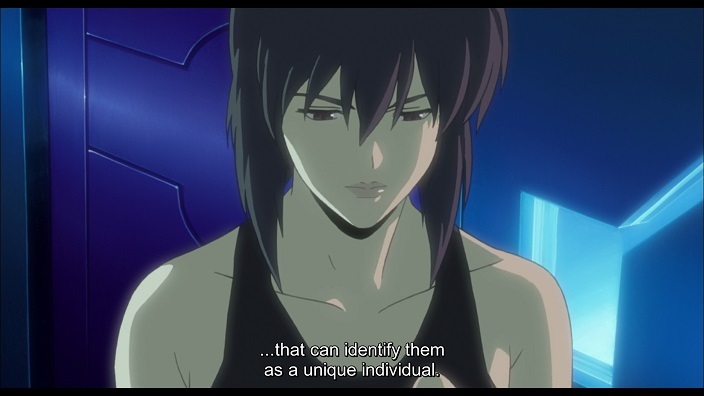 After the major gets shot, we hear her talking to Aoi while she roams around bodyless on the net, she wonders about the possibility of keeping one’s individuality without a body. With the stand alone complex, people become copycats and in the laughing man’s case, copycats of an unknown original. Everyone wanted to become the laughing man, they didn’t care if they casted aside their individuality. The current world of gits:sac is well on it’s way to sharing all information on the network but what is not shared, the secrets, can be used to manipulate and blackmail people or organisations like serano genomics and other micromachine manufacturers were. But what if all the information was shared, what if secrets were no more? “Even in an ambiguous network society, there may be a positive new hope. When all information gets shared, then true individuality can exist. The director’s quote and the example of the tachikoma gaining individuality after parallelising are a “positive new hope”. There is something to gain in this new paradigm shift instead of something to lose.